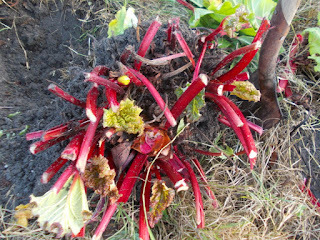 With a break in the weather I thought I will get stuck into my rhubarb as it will be harder when we get more rain next month. The winter weather started early for this time of year but I hope I am not in for a boggier spring than usual. I see that the ash trees are shooting with spring growth more than a month early and I don't know what that means for the rest of the season. 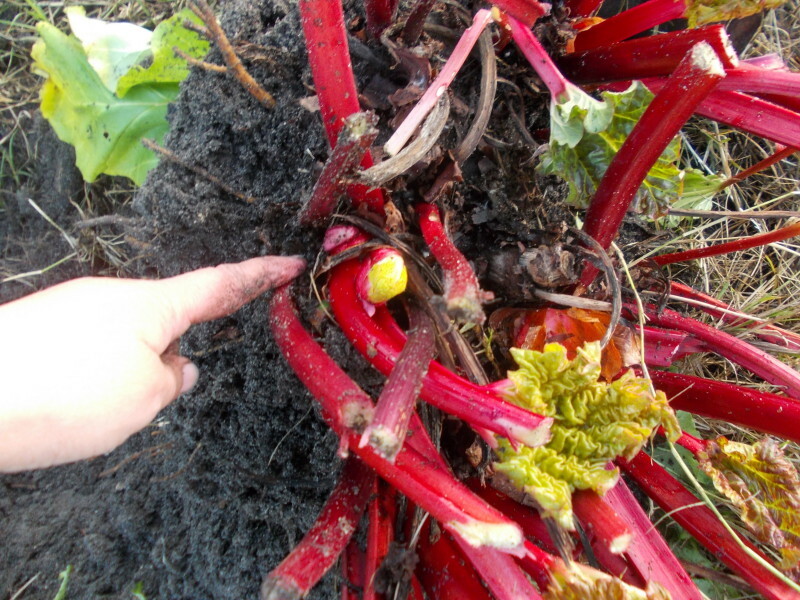 I usually don't plant rhubarb seed until early spring but I put some in early autumn this year. I just planted out the young plants yesterday. 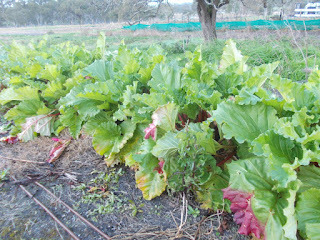 This is seed off an Australian variety called 'Next Generation'. It is bred for subtropical conditions so I don't know how it will fare through our winter. 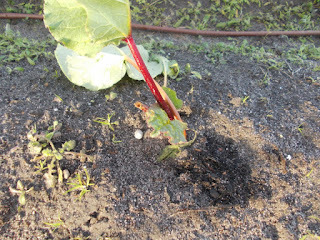 I will sow some more seed in spring then I will find out whether I prefer to plant it in spring or autumn. This is 22 plants. They are not very different but when they are bigger I will be able to see if any are particularly good in growth or flavour. 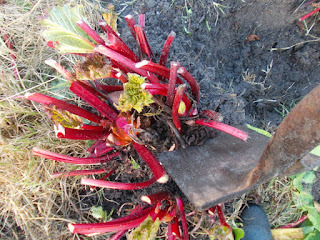 This morning I got to and started dividing my 'Red Rover' bed. here is how you should go about dividing, well, how I do it. 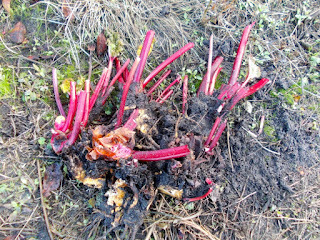 Many gardens have rhubarb plants but often the plants are old and crowded, and the stems are weak and small instead of large and fleshy. 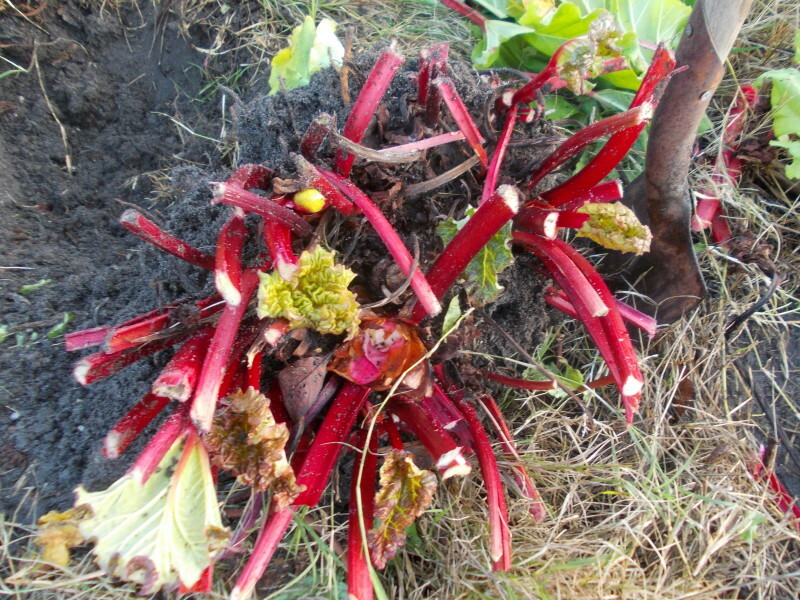 A rhubarb plant grows many shoots from the base and they get crowded with time so after 4-6 years the whole plant should be dug up, divided into individual shoots and one shoot/crown replanted to replace the original plant. 1, The first step is to cut back all the leaves so you can get at the main part of the plant. This makes it easier to dig up. 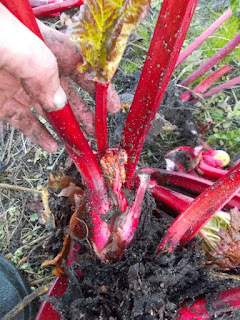 Just whack them off with a knife, spade or use secateurs. 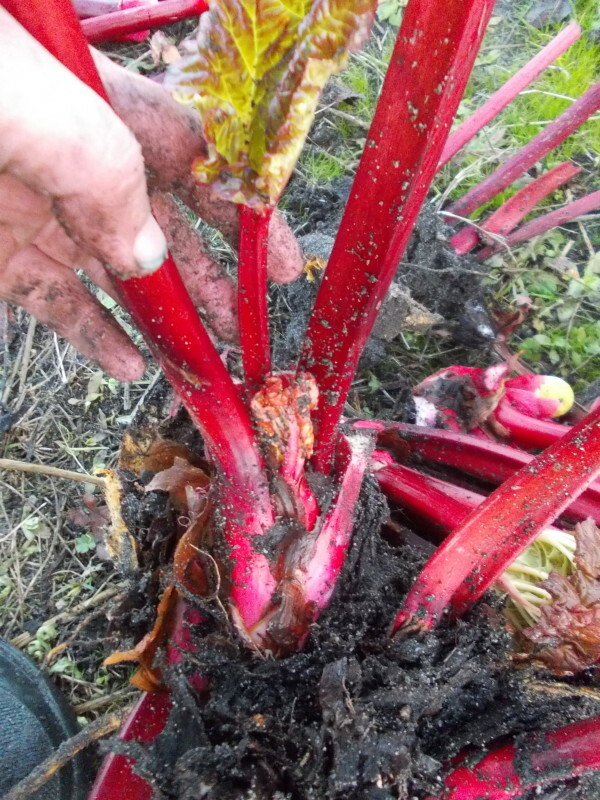 I prefer to divide rhubarb in winter but you can do it any time with not much trouble. 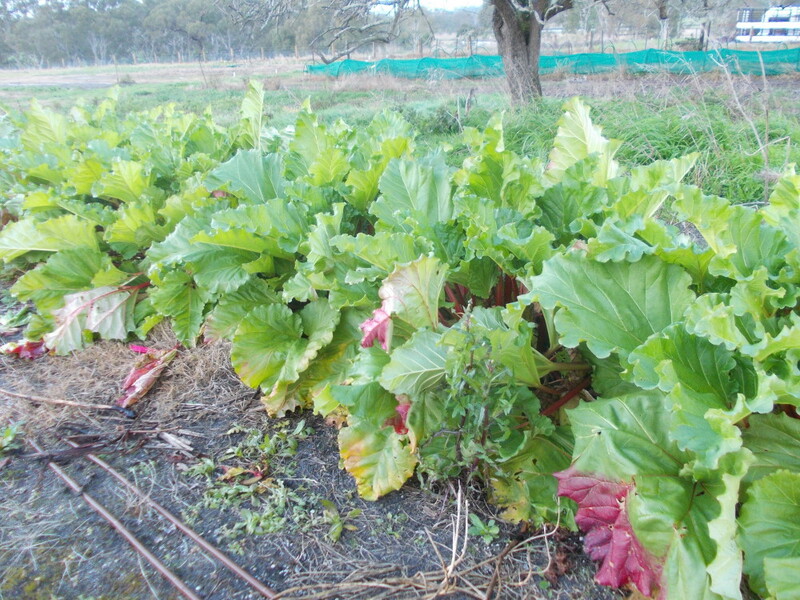 Some varieties go dormant in winter which makes this part easy. 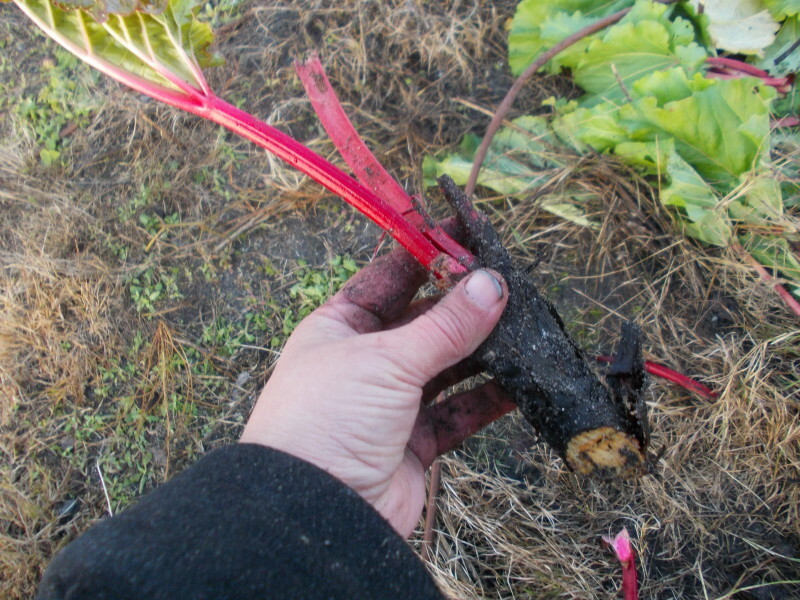 The variety shown in this article (Red Rover) is a winter productive plant that does not go dormant until spring. 2, Next you need to dig up the whole root ball. This is much easier than digging asparagus but can still be a chore if the plant is old and large. Just dig a spade depth all around the plant about 10-15cm from the plant itself. The roots are pretty fragile so you should be able to lift the root ball with your spade after digging it to break the bottom roots. 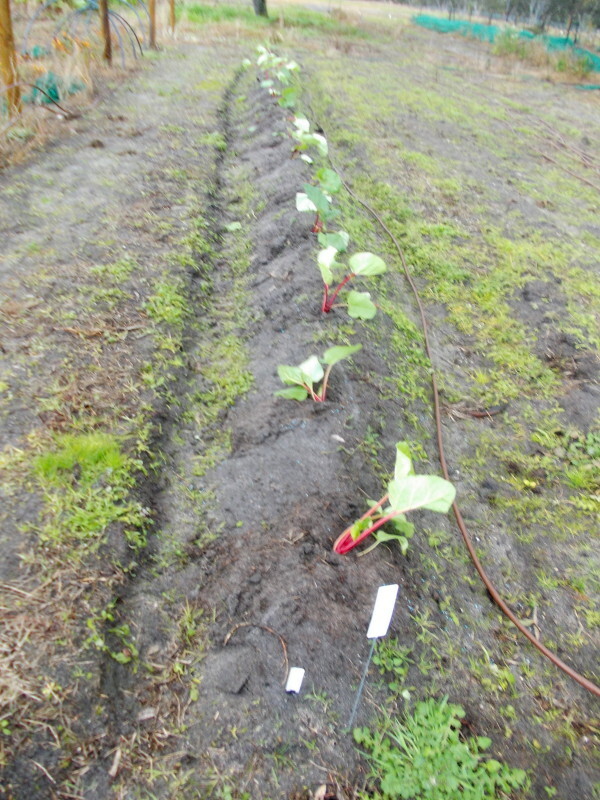 3, Step three is to identify all the separate shoots. 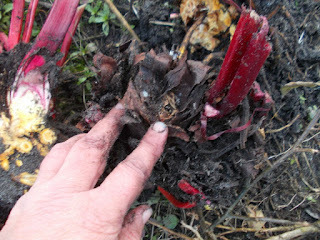 If you tease away all the top soil with your fingers you should be able to see the young shoots or young, unfurling leaves. A large root ball may have up to 20 shoots/crowns. 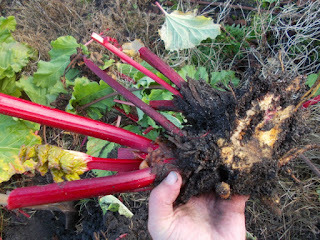 4, Take a spade and cut between the shoots/crowns to separate them. You will damage a few but most should be fine. All you need with each shoot is a bit of the main part of the plant. These will root easily. This was a fairly small plant and I got 11 separate crowns from it. 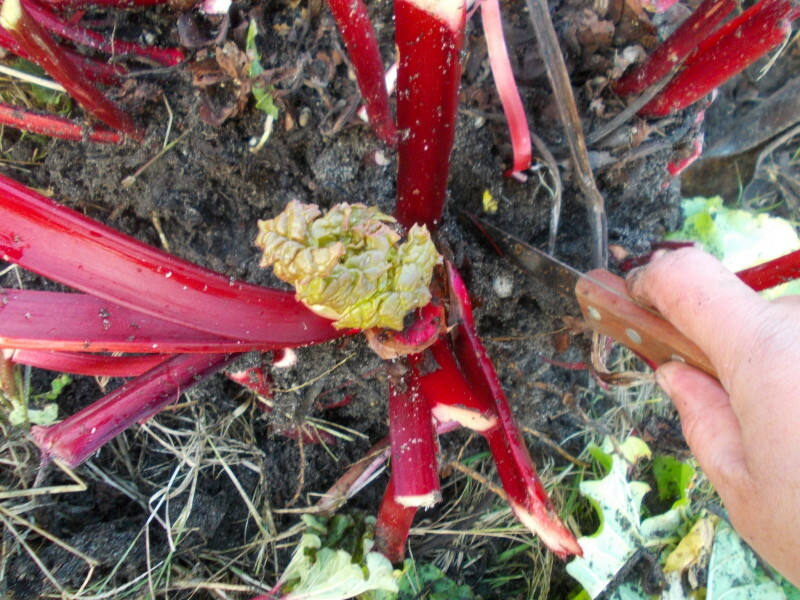 If you think you might damage the plant if you use a spade you can use a strong, sharp knife instead. This is an example of a nice, healthy new crown, ready to replant. Even a crown with only a bit of root like this will grow. 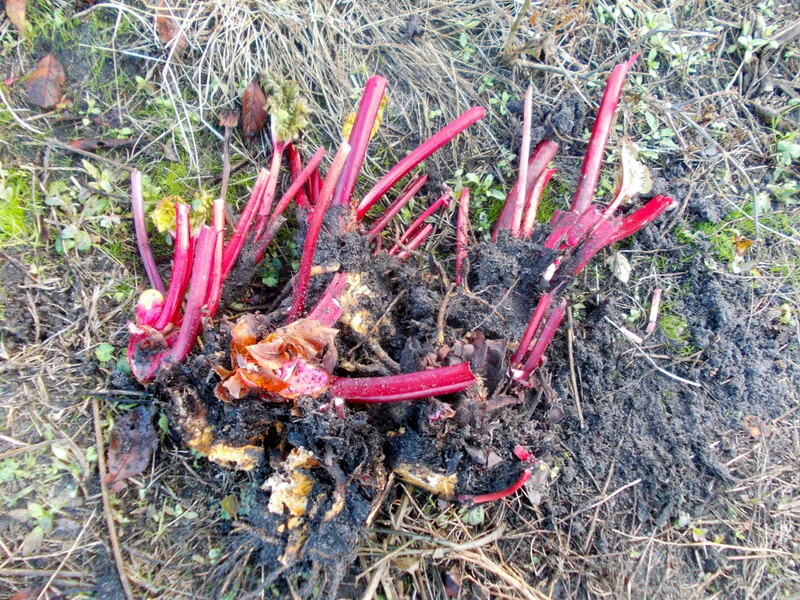 Rhubarb is a tough plant. Here is a piece with two crowns. You can snap it into separate pieces or plant it like this. Here is an old, dead shoot with a small, new one next to it. Throw it away or cut off the dead part. I separates 11 pieces from this plant to replant of give away. 5, Replant one or two of the shoots/crowns to replace the original plant. 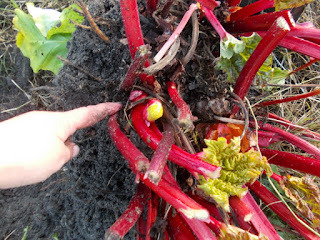 I like to dig a good size hole then mix a handful of fertiliser with half a bucket of compost. 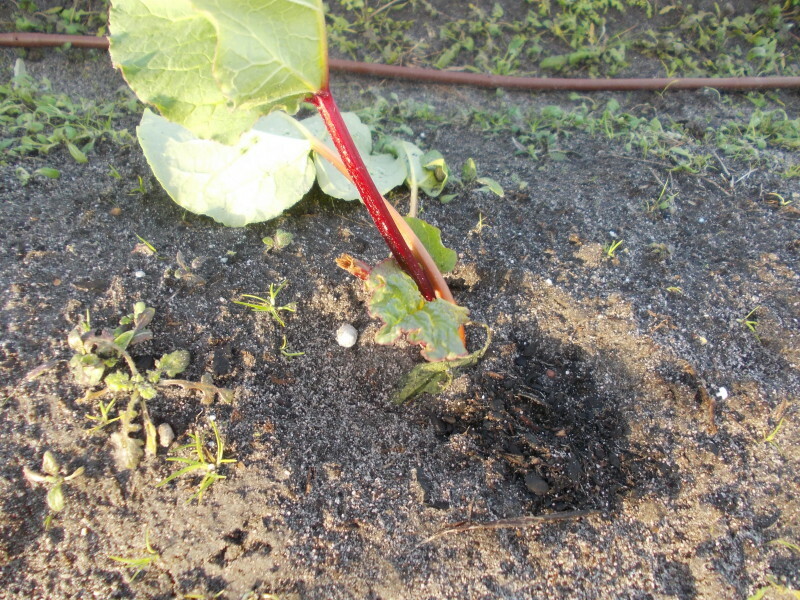 Pour into the hole then replant. The spare crowns can be given away to friends or taken to your local produce swap. 6, Now sit back until the warmer weather and watch your new plant sprout healthy new leaves. Try to limit taking many stems until the plant is large and healthy. 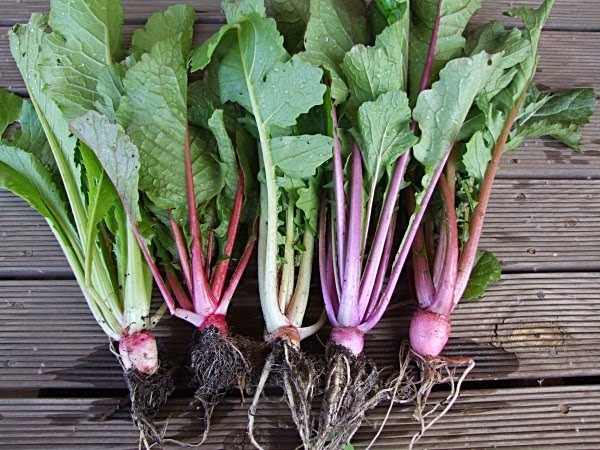 Some varieties may not get back into full production until the next year.